The Knight's Tour is a mathematical problem involving a knight on a chessboard. The knight is placed on the empty board and, moving according to the rules of chess, must visit each square exactly once. Many variations on this topic have been studied by mathematicians, including Euler in 1759. He published many solutions to the problem in "Solution d'une question curieuse que ne paroit soumise a aucune analyse" ("Solution of a curious question which does not seem to have been subjected to any analysis"), one of his more famous papers. It was the first mathematical paper on knight's tours. This paper, although presented in 1759, did not appear in print until 1766 in the Memoires de l'Academie Royale des Sciences et Belles Lettres (1759) 15, pages 310-337, Berlin: 1766. A modified version of this tour was used to encrypt the Grand Parchemin by his author. 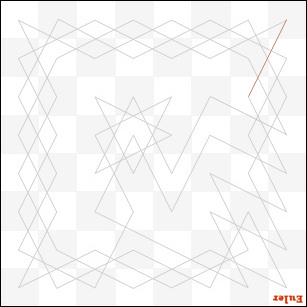 The chessboard has been signed "Euler" in red in order to make the reflexions simpler. 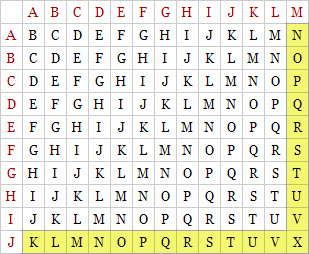 Consider the first letters (X and M): find the column M, look for the X on that column and write down the letter at the beginning of that row (J). You can create your own parchment with this tool. 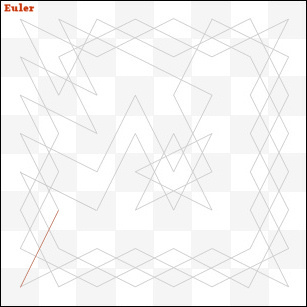 Many thanks to Marco Cipriani who published the reference to Euler's work here. Many clues indicates that Philippe de Cherisey was the author of this Parchment, not only his papers Pierre et Papier and CIRCUIT. The use of anagrams and of the Knight's tour is a typical "constrained writing technique", used in France in Sixties (the Great Parchment appeared in print in 1967) by Oulipo members. 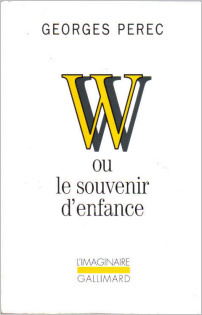 Oulipo stands for "Ouvroir de littérature potentielle", which translates roughly as "workshop of potential literature". 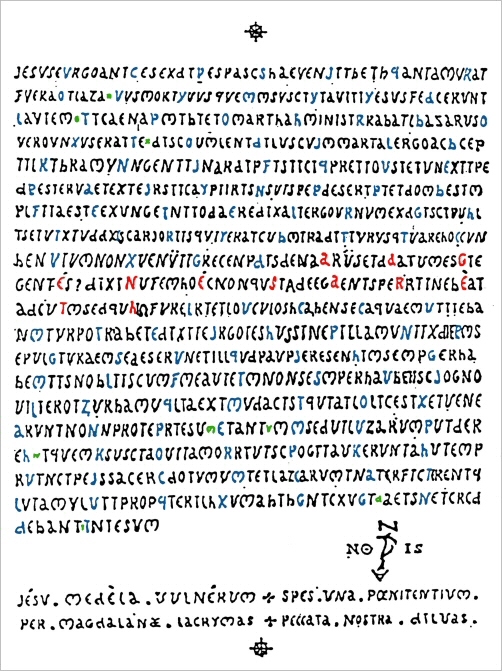 It is a loose gathering of (mainly) French-speaking writers and mathematicians, and seeks to create works using constrained writing techniques. It was founded in 1960 by Raymond Queneau and François Le Lionnais. 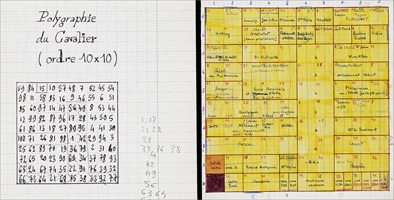 Other notable members include novelists like Georges Perec and Italo Calvino, poets like Oskar Pastior or Jacques Roubaud, also known as a mathematician. 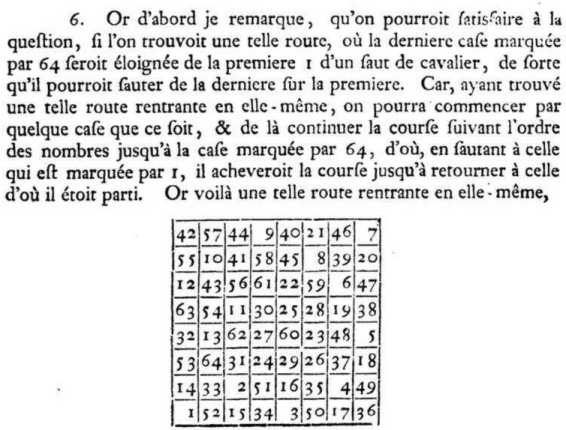 The Knight's Tour was used by other members of Oulipo: the most notable example is the 10×10 Knight's Tour which sets the order of the chapters in Georges Perec's novel La Vie mode d'emploi ("Life: A User's Manual"). In CIRCUIT, each chapter corresponds to a Tarot card. 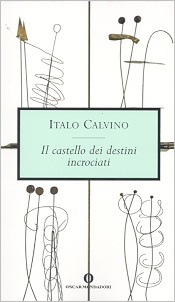 It is the same costrained technique used by Oulipian member Italo Calvino in The Castle of Crossed Destinies, a 1973 novel that details a meeting among travelers who are inexplicably unable to speak after traveling through a forest. The characters in the novel recount their tales via Tarot cards, which are reconstructed by the narrator. 1.Translation by Mariano Tomatis with the precious help of Marcus Williamson.